Last week, (in Part 1) we talked about the reasons budgeting never worked for my household until we unlocked the mystery of the cash flow plan. This plan changed our lives by helping us create and implement a plan to get out of debt and save money for the first time ever. This week, I want to finish telling you the system that worked for us. I recommend that you download this free worksheet before you begin the next step. These instructions will assume you are using it. In this step, we will only use Column A. We aren’t going to worry about the Cash Flow Plan until we balance the budget. Begin by inputting all of the income and expenses that you listed in the first two steps. 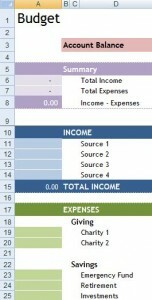 Input your income in the blue “Income” section and your expenses in the green “Expenses” section. If your expenses exceed your income, you only have two choices: Increase your income or reduce your expenses. You may find that you have to cancel some subscriptions to balance. You may have to cut back on some hobbies like shopping. This will not be the most enjoyable moment of your life. It will force you to deal with the reality that you don’t have a money tree in the back yard. However, it is a good lesson to learn now rather than later. To create additional income, you might consider selling some things to pay off a credit card or two. This would help reduce the amount of expenses you have and help balance the budget. Even if you can’t completely pay off the credit card, it is not a bad idea to get you moving in the right direction. You can’t skip this step. It is necessary before you move on to Step 4. Now that you have balanced your budget, you should know that you are further along in your financial plan than most of America. Congratulations!! However, you aren’t finished. The budget alone doesn’t work. It is time to give it legs and watch it walk. Start by typing your checking account balance in Cell E3. Each column will calculate to give you the beginning balance before you deposit each check. Your ending balance will show in Cell J3. Create a column for each date you receive income next month. I have created five columns for you already. You just need to change the dates to reflect your paydays. In other words, if you get paid twice and your husband gets paid twice, you should have four columns. 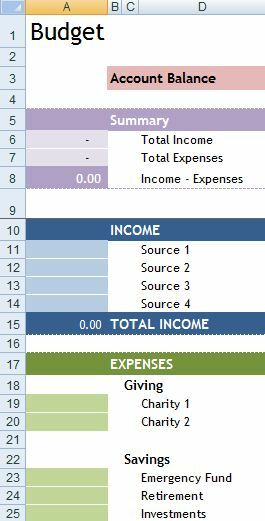 Now, plan out how you will spend each paycheck according to the budget you created by filling in Columns E – I. Make sure you give yourself time to mail your payments to your creditors. In other words, if your bill is due on the 16th, you can’t plan to pay it with the check you receive on the 15th if you have to put it in the mail. What bills get automatically drafted from your account? You need to know this information for your Cash Flow Plan. If your mortgage payment gets drafted on the 1st, but you don’t get paid until the 2nd, you are going to incur some overdraft fees. Be careful! Make sure you don’t plan to overdraw your account. You can’t pay all of your bills with the first check of the month. Well, most of us can’t. You will probably need to space them out over the four checks you receive. Your account balance is at the top in pink. If your plan overdrafts your account, you will see red numbers in Row 3. You’ll need to make adjustments. You did it!!! Now work the plan!! Don’t forget this step. This step needs to be done every single day. Your plan will only work if you work it. If you didn’t plan a trip to purchase new shoes, you should not go out and shop for new shoes. Otherwise, you will bust your budget and your Cash Flow Plan will fail. You should expect to have variances in your budget, especially the first few months you are trying to learn what your expenses really are. When this happens, you will have to adjust the plan. You may have to reduce some expenses in one area to make up for unplanned expenses in another area. If you planned a Miscellaneous category, it will help in this instance. Tracking each category is necessary to keep from overspending in each area. The easiest method is using a Cash Envelope method. This would mean that you pull money out of your account each payday and put it into cash envelopes for each category. If you would rather leave the money in the account and use a debit card, you will need to keep track of your receipts to make sure you aren’t busting your budget. Five steps are all you need for a balanced budget and cash flow plan. We are just normal people with normal incomes and we did this. And you can too. Remember, without a well-executed plan, your dream is only a fantasy. Your budget and cash flow plan is your key to unlocking your dreams. Copyright © 2011-2019 Curbed Chaos All rights reserved.